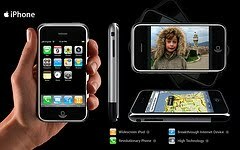 I saw a website article a few weeks ago displaying new conceptual models of iPods/iPhones. Most were wearable items like a ring or bracelet. After some time, I realized that these concepts were kind of sitting uncomfortably with me. I guess I just have a difficult time believing that the next generation communication technology interface will be something you wear. I’m prone to thinking that we are already at a pretty efficient interface ideal with the iPhone/Android/etc. At least until such devices are more bio-integrated and worn on the inside of our bodies. That is a subject for another time. For now lets focus on the current crop of smart phones. I think it’s definitely possible to see an evolution in electronic communication devices. Skipping the obvious face to face methods that have existed for thousands of years, I think the telegraph is a reasonable starting point for a communications technology as the term has come to be generally understood. The interface was stationary and passed information serially using only boolean data. Next came radio transmission, which in retrospect seems like more of an underlying support technology, allowing the telegraph to be mobile. Then the telephone, which began as a stationary unit for parallel audio transmission. Then we slid the radio technology under audio transmission and had what we now know as AM/FM radio, which at the time supported stationary transmitters, movable receivers. The receivers were too large and heavy to be moved regularly. 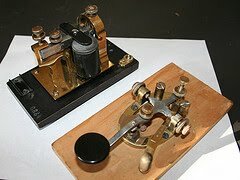 Next the radio technology came to the telephone and we had wireless handsets which were very mobile, but had limited range. 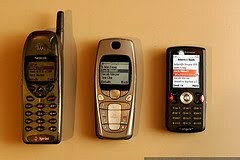 Soon the first cellular phones appeared, with gigantic battery packs and resigned largely to emergency use in a car, or for military communication. 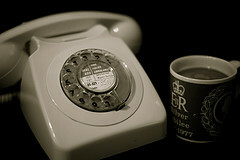 They slowly shrunk in size, and picked up more casual use and overlapped with the user base of landline phones. Computers also came on the scene, initially adopting a typewriter like interface for input and output. This hasn’t changed much from the keyboard/display setup we are still using with computers today. And lest we forget the fax machine, which I feel was already obsolete shortly after it hit the scene, yet for whatever reasons still has quite a user base. So at this point, this is probably looking like the so-and-so begat so-and-so bit from the book of genesis in the bible. We’re about caught up to current though. There already seem to be a few instances of convergence when a new technology or social use comes along. So here we are with a rapidly shrinking cell phone, and highly mobile laptop computers with wireless connectivity as well. These user bases overlap, and we start seeing the functionality of computers in phones (instant messaging, email, web browsing) and phone functionality in computers. (VOIP such as Skype, et al) it kind of makes sense to combine the two, and here we are with iPhones, Blackberries and Androids. Ok, so we understand a bit of the physical anthropology of the communications device, lets take a closer look at the interface. The profile we’re looking at is an object that can be operated with one hand and stored in a pocket, like a cellular phone, with an approximation of a desktop/laptop computer’s capabilities for high resolution display, data storage, input capability and processing power. Along the way we also convergent-ly picked up the functionality of digital cameras and music players. It’s interesting to me that we seem to have taken more functionality from the computer and shoe-horned it into the small package of the cellular phone. I believe that this illustrates the strongest aspects of each device. It’s also interesting that the camera and music capabilities are easy to tack on since the requisites for computer functionality provide an easy infrastructure to add these other functionalities. 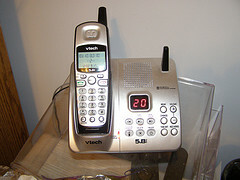 Since the general form is more like a phone than a computer, it’s easy to see that the interface of the phone functions will be similar to that of a standard, non-smart, cell phone. The physical form of the computer on the other hand, was large, and this size was mostly occupied by the I/O elements. A smaller screen, and likely lack of a physical keyboard show the need for a modified interface. It’s very important to note that there is a trade off here. What we have wound up with interface wise is a stripped down version of what MS windows and MacOS have been all along – a list of clickable icons. In absence of a mouse, we are now using touch screens. A keyboard is emulated, but almost all incarnations of this idea pale in comparison to the efficiency of a standard computer keyboard. After all that, I hope you can see my point. We have arrived at the modern smart phone handset through a kind of natural selection, adopting traits of communication devices we find beneficial and leaving others behind in favor of more favorable traits. The beginnings of a move away from a physical keyboard illustrate this idea – the small, portable size of smart phones might be more important than the typing efficiency of the old keyboard. As a result, we also see the social ramifications of this with truncated language (O I C. U R welcome. LOL.) use starting on mobile devices and spreading to more traditional forms of communication. Could we assume that the use of mobile devices for communication is more important than maintaining traditional language norms? 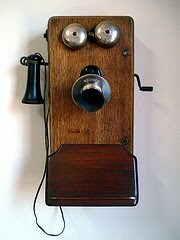 I personally cannot see any immediate jumps away from the current smart phone hand set. It seems like a very flexible platform that has not been fully tapped for functionality yet. I believe that a more functional voice control, such as the one in the iPhone Google app, and the Android maps feature, will be the next step with this platform, allowing information request and retrieval to take place over a headset with limited physical interaction with the hand set. This would be highly dependent on voice recognition technology, which on the iPhone and even on desktop computers seems to be a ways off. If and when the VR technology catches up, concepts like the iPhone ring or bracelet will make a lot more sense, but until then seem like they would just be a hassle to interact with. For more realistic future implementations I hope to see gesture control and perhaps more accelerometer control. But who knows what we will see.